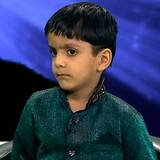 Let us meet the wonder child, who is popularly known as “Google Boy”- 5-year-old Anmol Narayan Swami from Gandhinagar area of Meerut district of western Uttar Pradesh. The child prodigy, Anmol has left everyone spellbound who have met him. He garnered media attention when he received the title of Meerut’s Google Boy in Feb 2014. Anmol is blessed with a sharp memory and can recognise the name of almost all capitals of all countries in the world, within minutes. He knows the names of all the Indian prime ministers in a chronological order, at a lightening speed. His extraordinary grasping power and talent has also caught the attention of state’s politicians. Uttar Pradesh BJP Chief Laxmikant Bajpai took note of his immense knowledge and wrote to the Chief MInister Akhilesh Yadav to encourage his talent. As a reward, Anmol and his two siblings have been promised to get free education, stationery, uniform and conveyance until they completed their schooling. He strated speaking, everyone was left awestruck. Anmol’s favourite Bollywood actor is Shah Rukh Khan.